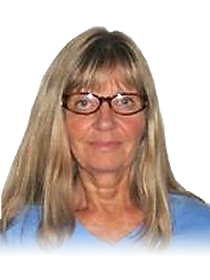 Welcome to the Certification Board for Urologic Nurses and Associates (CBUNA) website. 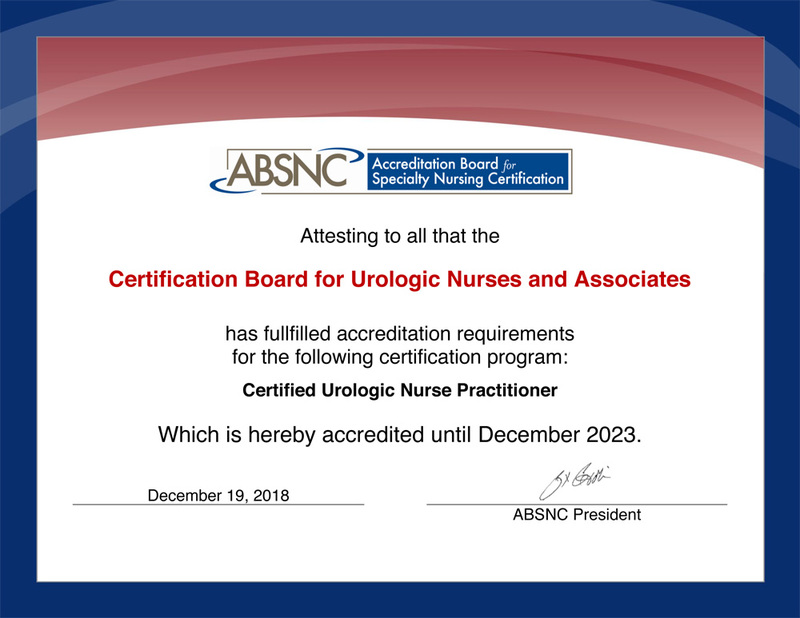 CBUNA is the only national certification body established to certify urologic nurses and associated allied health care professionals in urologic nursing practice. 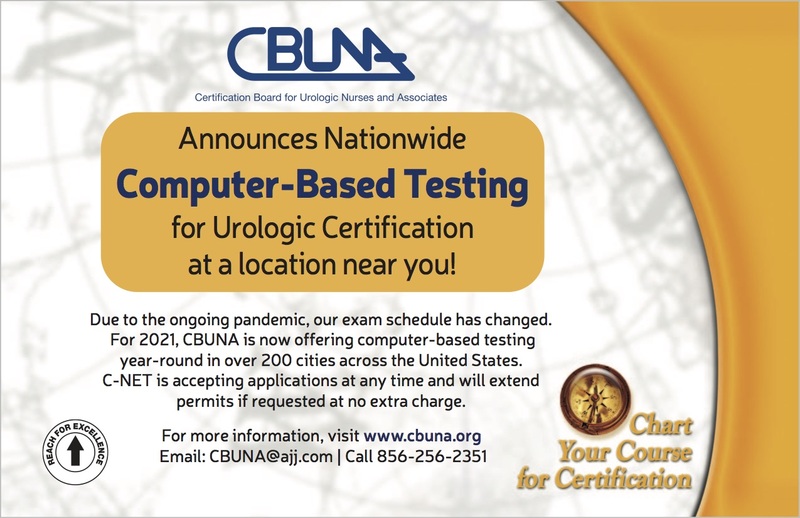 Take a moment or two to learn more about our certification process and how CBUNA will help you reach your personal and professional goal of becoming certified. Certification through CBUNA is an investment in your career that enhances your self-esteem, confidence, and professionalism. Thank you for visiting and for saying "Yes" to certification as a testimony to your hard work and expertise in the care of patients with urologic disease. Certification improves your skills and knowledge. As you prepare for certification, you will become familiar with topics that you do not routinely encounter in your everyday job that will add richness and depth to your knowledge base. Certification can improve career opportunities and advancement. Certification shows that you are willing to invest in your career and ongoing knowledge, and have demonstrated mastery. Certification may result in increased economic advantages. Some facilities offer bonuses or hourly differentials for certified individuals, and certification can serve as a point for negotiation and advancement in a yearly performance review. Certification demonstrates your commitment to the care of your patients. It validates your commitment to your chosen specialty, and reflects a higher standard of knowledge in your role. Certification enhances the professional image of your role. Certified individuals can serve as role models for others within the profession, as well as students of all healthcare disciplines. Certification reflects achievement on a both a professional and personal level. Because it is through a third party, certification substantiates that you have attained mastery of a particular set of specialty knowledge. Certification builds self-esteem. Certification defines you beyond your job description or past achievements, and is a reflection of your drive to establish your expert knowledge. Certification may lead to greater on-the-job responsibilities. Certification is a recognizable indicator of your willingness to invest in your own professional development, and certified individuals are likely to be more aware of changes and trends in their field. Certification allows peers to recognize you as an expert in your specialty field. Healthcare professionals, patients and their families will recognize that you have taken an additional step in your career and have additional expert knowledge. Certification grants you professional credibility. Certification is an impartial, third-party endorsement of your knowledge and experience. In the absence of any “residency” or educational post-degree certificate programs, certification is the single best way you can testify to your expertise. Adapted from Quallich, S. (2012). Top ten reasons to become certified. Uro-Gram, 40(3), 15. Connect to Amazon.com via the link below and support CBUNA while you shop!